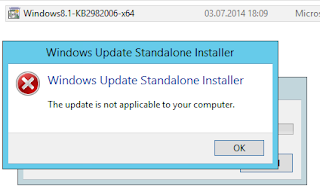 This issue is actually not an issue, it only indicates, you haven't install the windows server Roles and Features yet. 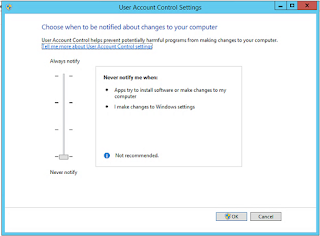 The Update address an issue in IIS. Therefore install the windows prerequisites first. As you can see, the hotfix is now applied proper. I was asked how to turn off the stress tune while you headset microphone is muted. First you need to know, this is NOT a Skype for Business Client feature. This is only happend when you use a JABRA headset. There is only one possible solution. 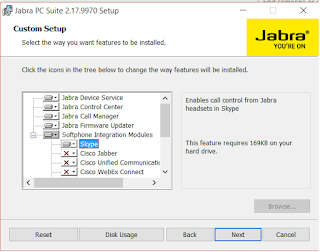 Jabra offers the PC SUITE. 4. Uncheck "Enable mute reminder tone"
Not every Jabra headset supports this or even the comfort noise setting. So please test your headset before you buy them. Very often we as MVP are asked about the Busy-On-Busy feature missing Skype for Business. The native feature for every single device, user or other client is not yet available. And I can't make any announcement until today if this is planned or not. What it the Share Line Appearance. This is a new feature introduced with the actual firmware from Polycom VVX and last Skype for Business Update November 2015. Shared Line Appearance (SLA) enables you to configure a group of multiple devices that can each answer calls to a shared phone number (extension). What does this mean to us. Well we can use busy on busy only within the VVX configured groups. But not yet between devices and client, or between soft clients. Today I'm digging deeper into Skype for Business Broadcast Meeting. As its not all about video, the presentation side is important. how to make PowerPoint visible to the audience. Also it is easy to handle? How is the user experience when a user joins via a webbrowser? Simply said it is excellent. Have a look and I explain what to do and how to use it. If you join as an authenticated user and being part of the Presenter Team, the browser checks the Desktop App and will ask you for access permission. As usual, if you click the "Monitor" button, it give you the option uploading a PowerPoint file and als manage the content. Once it is uploaded it is show in the preview windows, where you can also use the PowerPoint Tools e.g. the marker or others. First I start with, broadcast meetings are in an very early stage and introduce only a handful of planned and great feature still coming. Therefore I ask you to read this article frequently seeing the updates will I can blog about. The Broadcast meeting relays on the Azure Media Services and must be delivered online. As you see, the scheduled meetings are visible at this level. They will appear in the three column design. Simply if you need to schedule a new meeting, click the "New Meeting" option and start configuring it. Here going define the meeting. With Skype for Business Server 2015, the usability for SQL Server has advanced once more. We have now a couple of possibilities. Today I'm going to discuss all of them and will advice the actual licensing strategy based on SQL Server 2104 in regards to Skype for Business Server 2015 recommendations. One generic topic I have to discuss first. In many cases we are using Hyper Visor technologies, meaning the SQL servers are virtualized. Here one important consideration you should keep in mind. If the SQL Server is virtual AND you use CPU CORE licensing, you can run as many virtual SQL on a single PHYSICAL host as you want. You only need to license the physical CPU of that host. This applies to all physical hosts uses. Coming back to the most common question about certificates in Skype for Business and Lync Server. Can we use Wildcard Certificates in Skype for Business or Lync Server? In Skype for Business the main reason for certificate use is TLS/MTLS data encryption and the other point it the server authentication/ validation. Skype for Business is using the Common Name CN for authentication/ validation trusts. Only if a server with in the Topology or for Federation purposes presents a valid certificate with its matching Common Name (CN) the entire traffic can be used with TLS/MTLS. Therefor we understand a CN identifier as FQDN of the Server or the Pool is RECOMMENDED! While your are installing and publishing a Skype for Business Server 2015 Topology, you have to create a File Share for all important services. In this example the File Share is located on the same server which will later host the Skype for Business Standard Server. But in larger or other setup, where the File Share is located on SAN, DFS or File Cluster, you might experience the same issue. Skype for Business Topology Builder:Must be started with: "Run as administrator"
Since the installation of Skype for Business 2015 Server require a modern OS, only the Standard and Data Center version of Windows Server 2012 and 2012 R2 are entitled for an installation. Both servers having the same prerequisites. Recommendation for Windows Server 2008 R2 is only give for in-place upgrades. (please consider the KB 2858668, KB2982006 and KB2533623 for in-place upgrades and fresh installations) Windows Server 2012, KB article 2858668. Download. Windows Server 2012 R2, KB article 2982006. Download. Windows Server 2008 R2 KB article 2533623. Download.